We got back on I-10 leaving Quartzsite this morning, which wasn’t much fun but luckily we were only on the interstate for about 18 miles. 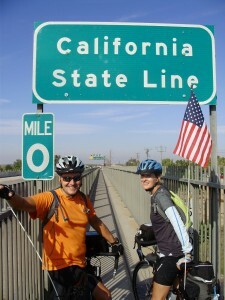 We then crossed the Colorado River and the California State Line!!! As we rode across the pedestrian bridge and back down to the frontage road, there was a small marina and park where there was a car show going on. This area seems to be a haven for antique cars! We looked around for awhile before getting back on the road. We went through a number of small towns, but there was really nothing exciting to see. About 30 miles into the ride we encountered a very strong headwind, which slowed us down considerably. It was also a lot warmer, about 85º. We stopped in Palo Verde for lunch at the “Lagoon Saloon”. Penny picked us up here, as this was the end of our ride but there was not anywhere to stay. She will take us back to this spot in the morning. Rob and Steve got haircuts while Penny and I got coffee and then we hung out until we went to dinner. At the hotel we saw a flyer for a dinner and concert at the marina, so we headed that way not knowing what to expect. We saw that the entertainment included Paul Winer – yes, the naked guy from the bookstore! The meal was chicken, baked beans, potato salad, rolls and beer/soda/water and the entertainment was amazing! Paul played some great boogie woogie and blues music, with many of the songs he wrote when he performed as “Sweet Pie”. (and yes, he was dressed, but when he performed as “Sweet Pie” he was not!) He was accompanied by washtub player, Ralph Martin. What a great evening! We were commenting later that we were very quick to judge this “crazy” naked guy, but he turned out to be funny and talented and a wonderful entertainer. It will definitely make us all think twice before we start to label others. This morning we were able to walk out of our rooms into the motel kitchen, which felt very much like home, and gather around a breakfast table. Randy made us all coffee and we had yogurt and melon for breakfast before heading out. It was a little cold (about 55º) and looked like it might rain. We had great big shoulders and little traffic for most of the ride. We went through Hope, Arizona and as we rode out of town there was a sign that read “You’re Now Beyond Hope”. We had to get on I-10 for about 12 miles, where there was very heavy truck traffic, but the shoulders were good so we were able to stay off the road. That’s where we picked up a 20mph headwind, which is no fun, especially with all the wind from the trucks! It was also very noisy, so we couldn’t speak to one another at all. 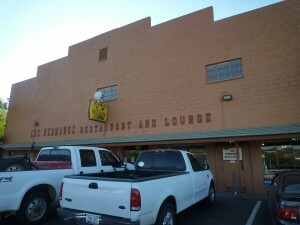 As we pedaled into Quartzsite, we all noticed what appeared to be a naked man standing in front of a bookstore. He motioned for us to come in, but we were a bit in shock! After getting to the hotel and changed, we all headed out for something to eat, telling Penny and Barbara we were going to stop at this cool book store afterward. We had a great lunch at “Sweet Darlene’s” (along with some amazing desserts) and headed over to Reader’s Oasis Books. The look on Penny’s and Barbara’s face was priceless! Standing in front of the shop was an older gentleman with long hair and a long gray beard and leathery skin. He was wearing only a strategically placed cod piece held by fishing wire and tape. Once we got over the awkwardness of speaking to someone dressed only in their birthday suit, we found out that Paul Winer (aka Naked Paul) was the owner of the book store. He had a very eclectic shop, with many different kinds of books (used and new), including some that were very rare. It was so much fun to browse around and spend some time exploring. We then did a little more shopping but we’re too early for the reason most people come here. Nine major gem, mineral, and 15 general swap meet shows, held mostly in January and February, attract about 1.5 million people annually! 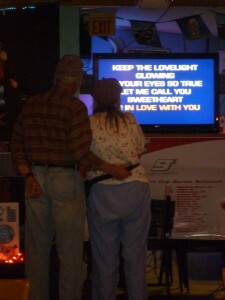 We had dinner at Silly Al’s Pizza and then stayed for the karaoke. We had a lot of laughs, although we didn’t know most of the songs that were being sung! 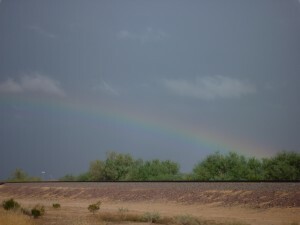 We left Wickenburg this morning after having had a rain storm overnight. It was a little chilly but the clouds were moving away and the sun was breaking through. We had a gradual climb for most of the ride (in the first 10 miles we climbed over 600 feet) and there wasn’t much to see but the mountains in the distance and the cactus in the desert. Steve spent a lot of time riding in the middle of the road (traffic was very light) and looking for dead bodies (thankfully, he didn’t find any!). We stopped for coffee and pie at Coyote Flats in Aguila. The pie was homemade and delicious! We passed lots of melon fields and as we came into Salome there were pistachio trees, cotton and organic carrots. Penny and Barb found a cute place to stay called “Westward Motel” and we cycled right into the parking lot. After a quick shower, we headed out to the local sandwich shop, “Buckaroo Cafe”, where we had a great lunch. 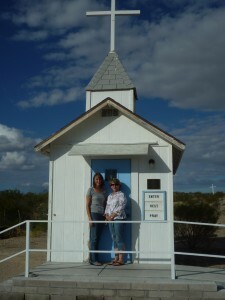 We drove around the small town and found the tiniest little chapel and lots of RV parks. Apparently, many people come here to stay during the winter. We went back to the hotel to read and relax and answer emails. This was the first time we really felt “at home”. Randy, the owner, has done a great job of fixing up an old motel with 5 rooms and making it very comfortable and welcoming. We walked across the street to the local market for bread, drinks and the makings for s’mores. We used the motel kitchen to make peanut butter sandwiches for dinner and sat outside with Randy and his friend, Janet Leigh. We had a great night talking and laughing and making s’mores. When we left this morning, it felt a little odd to have 3 people riding instead of the usual two! Rob, Steve and I rode out of Phoenix and were making good time and enjoying the ride when Steve got his first flat. He changed it quickly and we were on our way again – for about 1/4 mile. Flat #2! We were on our way again fairly quickly and then – flat #3! That’s when Steve found the piece of glass that had left a gash in his tire. Penny and Barbara met us on the side of the rode so that we could get more tubes and Steve changed his tire once again. Luckily, he didn’t have any more problems after that! We pedaled through a few rain showers off and on for most of the day. Not enough to cause a problem, but enough to make us a little chilly! That was a welcome change. We were also able to see 2 rainbows! We found a Dunkin’ Donuts right as we entered town and stopped for a cup of coffee to warm up. Wickenburg is known as the “Dude Ranch Capital of the World”, but I won’t be getting on a horse while we’re here! It has a downtown that looks just like it should be in an old Western movie and the people are very friendly. We walked around town for a little bit and then had lunch at Nana’s Sandwich Saloon. Their sandwiches were amazing and the quiche was perfect! We then had to take the van in because the “low tire pressure light” wouldn’t go off and Jones Auto Center worked on it for free! We went to Anita’s Cocina for dinner and the food was delicious. 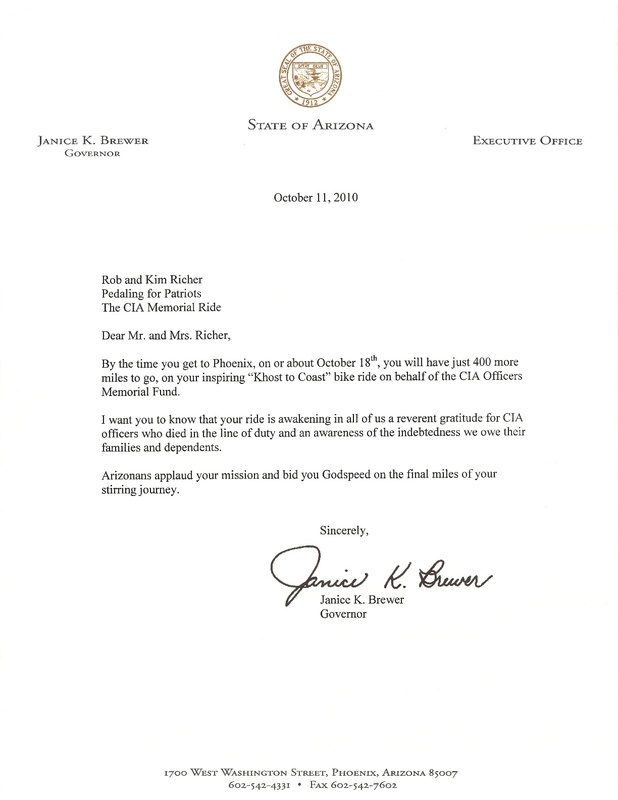 This is a video of Rob and I receiving the letter from Governor Brewer. Dave Hampton of the Arizona Department of Veteran’s Services presented the letter. 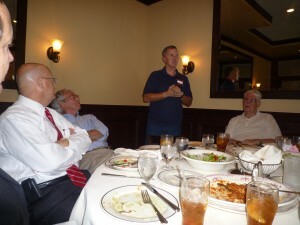 Today we were hosted at lunch by retired officers of various agencies of the U.S. Government. Present at the lunch were prominent local businesspeople and senior representatives of the FBI and Intelligence Community. We discussed the purpose of the ride and a variety of other topics. We received donations for the fund as well as future promises of support. 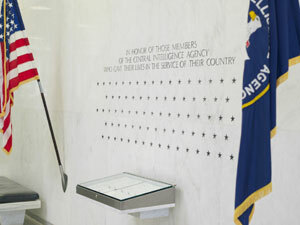 It was a great venue to discuss the service and sacrifice of the men and women of the CIA – and the food was great! We did a last minute service on Rob’s bike, as he was having some difficulty with his back tire. He ended up needing a new one and Southwest Bicycles was able to replace it quickly and at a reduced price. We went to the local thrift store to make a few donations and also went to UPS and mailed a few boxes home of the items we no longer need. It’s very exciting to think we’re getting so close to the end! Another great day in Arizona! We slept in a little bit (got up at 6:30 instead of 5:00) and planned a slow morning. However, we got a phone call saying that ABC News, Channel 15, wanted to do a live interview at 9am. So we had a quick breakfast and got our bikes ready. The interview went really well! Then Rob had to change my front tire since it got a flat sitting in the van! It appears that it was a defective tube, since the hole was on the inside seam. We then biked toward the Arizona Capitol building about 20 miles away. We allowed ourselves plenty of time and I was glad we did! We were able to bike at a leisurely pace and take in the sites. We biked through Arizona State University; what a beautiful campus! We crossed the Salt River and stopped to look at Tovrea Castle. We got to the downtown area with time to spare, so we stopped at a small cafe for drinks. We then pedaled toward the Enduring Freedom Memorial and were greeted by Dave Hampton (of the Arizona Department of Veteran’s Services), NBC and CBS, and the new friend we met last night, Jay. We were given Arizona state coins, pins and a letter of welcome from Governor Jan Brewer. We spent some time taping a few interviews and speaking with Dave and Jay. The park near the Capitol is filled with memorials and we were able to view a few of them before we had to leave. A few weeks ago, we received an email from Bill Kiess, who lives here in Phoenix, telling us that our bike map was routing us into dangerous territory and gave us an alternate route. Yesterday, as we were planning our route, we were confused as to how we were going to get from the Capitol to our hotel. So, I emailed Bill to see if he had any ideas. He was kind enough to send us an email with all of the necessary turns and corresponding mile markers. It was a great route and kept us off many of the major streets and intersections. We were even able to ride along the canal for about 10 miles! Not long after we got to the hotel, Steve (our friend from DC) arrived. He will be riding with us for the reminding of our trip. He shipped his bike here and we drove to REI to pick it up. It will be great to have another rider to share our journey! I hope to have a few more pictures up tomorrow, after Penny and Barb have a chance to load them. I’ll also have a copy of the letter! It felt a little strange to be back on the bike after our break. We started our day back where we left off on the 13th. 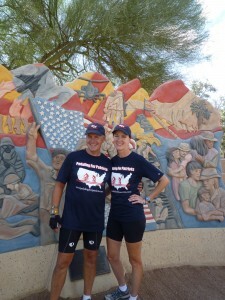 We pedaled through Superior, AZ which has special memories for the Jewkes family – this picture is for them! After leaving Superior, we bicycled through Gonzales Pass and down into Florence Junction. Huge saguaro cactus are everywhere and there are lots of flowers in bloom. The shoulders were broken and very bumpy and we ended up having to ride in the road with traffic going 65-70mph! We then went through Superstition and Apache Junction (got to love these names!) on our way to Phoenix and we had bike lanes almost the entire way to the hotel. We went to the Arizona Biltmore Hotel for dinner with our good friend, Vince Flynn and one of his friends from high school, Jay. It’s a beautiful hotel and the food was wonderful and the conversation entertaining. It was a great night!